LRAD long range acoustic device sound cannons were used for crowd control in Ferguson, Missouri protests. A St. Charles County SWAT vehicle equipped with an LRAD 500X-RE. An hour after SWAT teams arrived, streets were completely blocked off, helicopters were circling, and officers were pouring tear gas onto West Florissant and the surrounding neighborhood, launching flash bangs, shooting rubber bullets, and using noise-based weapons to force people inside. Most of these crowd-control tactics are, unfortunately, familiar, whether you’ve personally encountered them or just heard about their use. But what’s a noise-based weapon? The ones used in Ferguson are called LRAD sound cannons, or Long Range Acoustic Devices, and they allow for very serious crowd control. 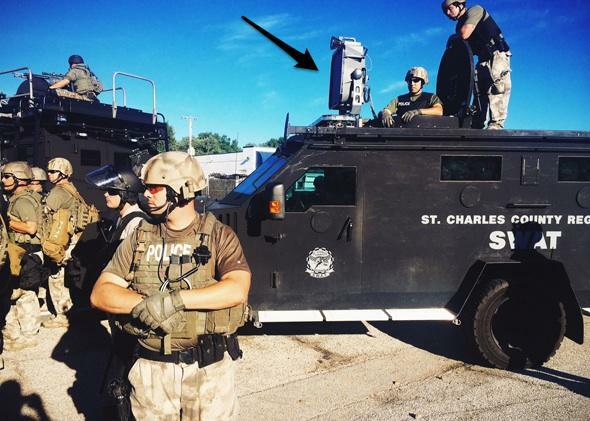 The LRAD 500X-RE, the model that appears to have been present at the Ferguson demonstration, “achieves maximum sound projection and penetration beyond 2,000 meters” and can reach 149 decibels. The 500X-RE gives law enforcement “the ability to issue clear, authoritative verbal commands, followed with powerful deterrent tones.” And according to a report by the Economist in 2004, those deterrent tones cause immediate headaches and pain. Since LRADs can blast above a person’s 120-decibel discomfort mark, and their 130-decibel threshold for potential hearing loss, there’s no telling what the consequences of encountering a LRAD may be for protesters. One woman sued the city of Pittsburgh for permanent damage caused by an LRAD. And the Missouri Department of Transportation purchased two LRADs in April, though it’s unclear if they are the same ones used in Ferguson. 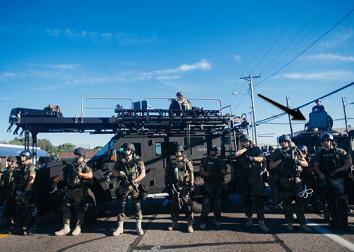 LRADs may look like dopey satellite dishes, but the SWAT teams in Ferguson on Wednesday definitely brought out the big guns when they turned on the deterrent tones. Not to mention their actual guns.